Displaced women and children in a camp in Paoua, Central African Republic. Yaounde - People fleeing war, natural disasters or violence within their own countries could be costing countries a combined $13 billion a year, a new study released on Wednesday revealed. The yearly financial losses ranged from $174 per person in Somalia to $451 in the Central African Republic, said researchers at the Internal Displacement Monitoring Centre (IDMC) in Geneva, part of aid agency Norwegian Refugee Council. "Taking the average cost per IDP (internally displaced person) across all assessed countries, $310, and applying it to the total number of IDPs in the world - 40 million as of the end of 2017 - would result in a global financial impact of internal displacement of nearly $13 billion per year," IDMC said in a statement. "It's very good to invest in responses to crises... But the best solution would be to prevent internal displacement altogether. This can be done through, for instance, efficient disaster risk disaster strategies," she said. Out of the eight countries surveyed, the Central African Republic was found to have the highest economic impact for each person forced from their home, amounting to $230 million per year, or just over 10 percent of the country's pre-crisis GDP. 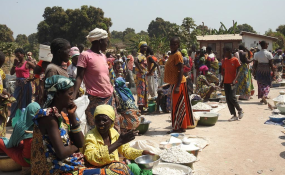 In displaced persons' camps in the country's capital, Bangui, 80 percent of those who fled their homes were forced to interrupt their jobs, the study noted.